Dyllis is a chef in Super Paper Mario. She runs the Hot Fraun, a restaurant located on the first floor of Flopside. She is the Flopside counterpart of Saffron, the Flipside chef. Other than their personalities, Dyllis differs from Saffron because she requires two ingredients to make a dish, as opposed to Saffron who needs one. The player can come to the restaurant and supply two ingredients to Dyllis, which she combines into one item. 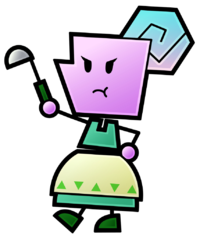 Dyllis could be described as paralleling the characteristics of Zess T., a cook from Paper Mario: The Thousand-Year Door, for her irritable and gruff personality, demanding ingredients and calling the player names like "bratwurst" and "schnitzel." Dyllis's name derives from "dill", a herb which seeds are used as a spice in cooking. Another analogy is "dill pickle", since her attitude is sour. She also has a stereotypical German accent, similar to another chef character, Chef Torte. Fresh Veggie Cake Mix Restores 5 HP and cures poison. Pink Apple Snow Bunny Freezes on-screen enemies. Mild Cocoa Bean Cake Mix Restores 15 HP and cures poison. Mild Cocoa Bean Fresh Pasta Bunch Restores 5 HP and cures poison. Snow Bunny Berry Snow Bunny Gives the player 5000 points. Shroom Shake Spicy Soup Restores 15 HP and cures poison. Shroom Steak Gorgeous Steak Restores 90 HP and cures poison. Fried Shroom Plate Meat Pasta Dish Restores 30 HP and cures poison. Egg Bomb Dyllis Breakfast Burns on-screen enemies. Fried Shroom Plate Spaghetti Plate Restores 20 HP and cures poison. Roast Shroom Dish Fruity Hamburger Restores 60 HP and cures poison. Fire Burst Big Egg Burns on-screen enemies. Fire Burst Shroom Shake Restores 10 HP (50 HP in the Pits of 100 Trials) and cures poison. Peachy Peach Snow Cone Freezes on-screen enemies. Peachy Peach Mushroom Crepe Restores 15 HP and cures poison. Power Steak Keel Mango Restores 25 HP and cures poison. Peachy Peach Keel Mango Restores 15 HP and cures poison. Peachy Peach Shroom Shake Restores 15 HP and cures poison. Chocolate Cake Mousse Restores 30 HP and cures poison. Mild Cocoa Bean Golden Leaf Restores 25 HP and cures poison. Power Steak Hamburger Restores 25 HP and cures poison. Long-Last Shake Peachy Peach Temporarily and gradually restores 1 HP at a time. Cake Mix Lovely Chocolate Temporarily and gradually restores 1 HP at a time. Honey Jar Honey Candy Temporarily makes the hero slow. Shroom Shake Honey Jar Restores 10 HP and cures poison. Super Shroom Shake Honey Jar Restores 20 HP and cures poison. Horsetail Cake Mix Restores 12 HP and cures poison. Power Steak Fresh Veggie Restores 20 HP and cures poison. Inky Sauce Fresh Pasta Bunch Restores 25 HP and cures poison. Cake Mix Turtley Leaf Temporarily halves damage taken from enemies. Turtley Leaf Horsetail Temporarily halves damage taken from enemies. Turtley Leaf Fresh Pasta Bunch Temporarily halves damage taken from enemies. Lovely Chocolate Fresh Pasta Bunch Temporarily doubles attack, halves damage taken from enemies, and able to paralyze enemies. Big Egg Lovely Chocolate Temporarily makes game controls reversed, and gives the player 1500 points. Mild Cocoa Bean Fire Burst Temporarily doubles attack, halves damage taken from enemies, and allows the hero to paralyze enemies. Dyllis Dinner Fried Shroom Plate Restores 30 HP, cures poison, and temporarily makes the hero slow. Big Egg Keel Mango Restores 20 HP and cures poison. Power Steak Fresh Pasta Bunch Restores 18 HP and cures poison. (Wrong ingredient) (Wrong ingredient) Restores 1 HP and cures poison. Peach Juice Mango Juice Restores 20 HP and cures poison. Cake Mix Big Egg Restores 15 HP and cures poison. Shroom Shake Cake Mix Restores 20 HP and cures poison. Fried Shroom Plate Poison Shroom Restores 2 HP and cures poison. Big Egg Horsetail Restores 20 HP and cures poison. Peachy Peach Cake Mix Restores 15 HP and cures poison. Primordial Fruit Shroom Shake Restores 15 HP and cures poison. Sap Soup Cake Mix Restores 20 HP and cures poison. Shroom Shake Smelly Herb Restores 15 HP and cures poison. Super Shroom Shake Cake Mix Restores 30 HP and cures poison. Mild Cocoa Bean Shroom Shake Restores 15 HP and cures poison. Shroom Shake Dayzee Tear Restores 10 HP and cures poison. Big Egg Shroom Shake Restores 25 HP and cures poison. Snow Cone Turtley Leaf Freezes on-screen enemies. Ice Storm Shroom Shake Restores 10 HP (50 HP in Outer Space) and cures poison. Big Egg Hot Sauce Temporarily doubles attack. Hot Sauce Fresh Pasta Bunch Temporarily doubles attack. Inky Sauce Honey Jar Temporarily and gradually restores 1 HP at a time. Mild Cocoa Bean Poison Shroom Temporarily makes the hero slow. Mild Cocoa Bean Honey Jar Restores 5 HP and cures poison. Poison Shroom Couple's Cake Leaves the player with 1 HP, but gives the player 1000 points for every HP lost. Healthy Salad Big Egg Restores 20 HP and cures poison. Hot Sauce Shroom Shake Temporarily doubles attack. Peach Juice Hot Sauce Puts on-screen enemies to sleep. The Mistake is the only dish that can be made by both Dyllis and Saffron. Spanish Delia Pun on delicia (Delight). German Dillia Pun on dill. This page was last edited on March 3, 2019, at 23:26.